‘Life is not about the destination, it’s about the journey.’ Encouraging words often put on cheesy but inspirational posters that illustrate a long and winding road headed for some unknown place. 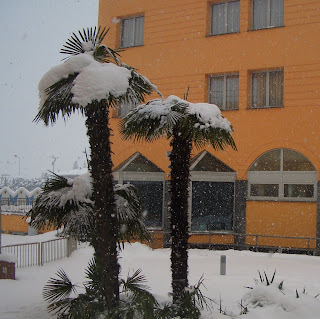 Now in the cosy confines of the Ramada Hotel near Malpensa Airport in Milan, I completely understand. We were bumped from our original Alitalia flight due to overbooking. 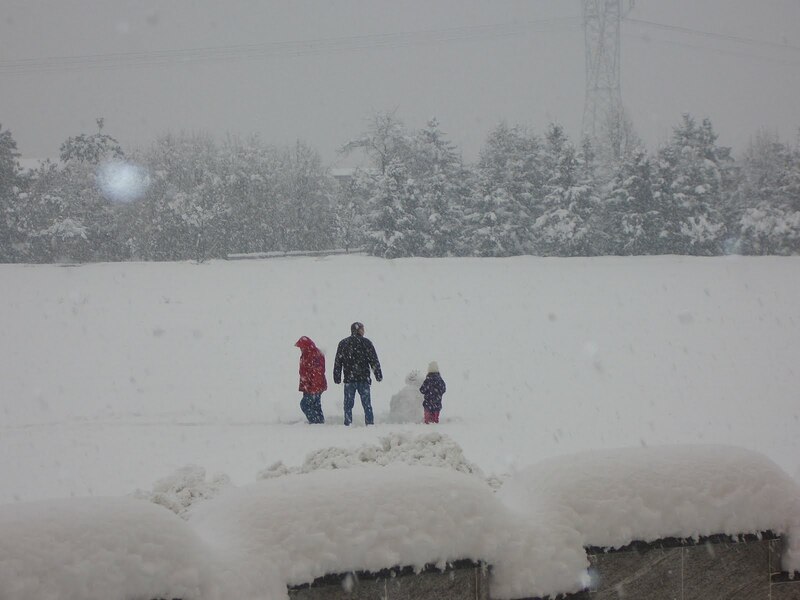 Had we arrived in Milan when we were supposed to, we would have missed the ‘exceptional snow storm’ as dubbed by the Italian media. From all of my travels I’ve learned one thing that has brought me a lot of peace over the years…if there is a 50% chance something could go wrong while on the road, there is a 90% chance it will. This isn’t pessimism, just reality. Travelling is rarely on schedule and almost never what you expect. Because Alitalia was the cause of our missed flight to Ghana they graciously take responsibility and offer to put us up in a nearby airport hotel. A tall, lanky, and very weary Alitalia agent with greasy black hair writes out a voucher that entitles us to transportation and accommodation at the Ramada Hotel. He passes us the voucher with a look of, ‘please don’t beat me’ in his eyes, as he has been dealing with irate passengers all day and is afraid of ongoing wrath. We appreciatively take the voucher and head toward the bus that will take us to the hotel. We board the bus and wait for all the other lucky souls, at the mercy of Alitalia. The bus load of us is very fortunate. Taxis are unable to navigate the icy, snowy roads and this bus is one of the only methods of transportation out of Malpensa Airport. The drive that would normally take twenty minutes takes two hours as the bus creeps along the snow-covered road at five to ten miles per hour. It’s dark outside and the snow flurries that fall on the open road ahead, illuminated by the bus headlights, create an eerie scene. No other cars are on the road and I feel like we're alone in the world. We finally arrive at the Ramada Hotel, actually located in the small town of Ollegio and offload from the bus. After the day of travel and the two-hour drive going snail speed, we are excited to go to our room and sleep. The bus load of Alitalia customers form a mob around the reception desk. To expedite the check-in process the staff requests that all guests leave their passports at the front desk so that the required information may be entered into the computer later without us all having to wait. Although uneasy about letting my passport out of my possession, exhaustion overrules and I anxiously leave the important document in the charge of the Ramada Reception crew. Alitalia will be paying for the entirety of our stay including all meals, rented movies, in-room Internet service, and telephone calls…everything. Sweetens the sour deal the snow has dealt- missing part of our vacation in Ghana. We go up to our room and find very comfortable, contemporary accommodation. To me, the image of Ramada is not exactly luxurious. In fact, in the past, I’d go out of my way to avoid it. However, this hotel that caters to business travellers is clean, modern, and good quality. We go up to our room, ironically room 237, the most haunted room in The Shining. Before bed we take a soak in the Jacuzzi tub, big enough for two, with views out onto the courtyard, covered in pillowy, white snow. The bath warms us up and relaxes our travel-weary muscles. We’re concerned that we won’t get to Ghana for at least a couple days due to the weather but feel lucky to have a very comfortable and very free place to stay while we wait out the storm. The poor saps at the airport are lying across plastic chairs made into makeshift beds, covered with jackets used as blankets, watching the flashing ‘cancelled’ signs on the arrival and departure boards as entertainment. We awake the next morning and look out the window…still snowing. We go down to the restaurant and find set tables and a breakfast buffet lined with all kinds of delicious breakfast foods; eggs, an assortment of Italian meats and cheeses, pastries, fruit and yoghurt. We drink fresh squeezed orange juice and strong Italian cappuccinos while enjoying our breakfast. After breakfast we walk through the lobby and find hordes of angry people hounding the receptionists and concierge. People are yelling in different languages, huffing and puffing their way into a tizzy. It’s an international gathering of complainers; Italians are loud and use their hands to gesture their frustration with the snow storm, a group of pushy Americans bump their way to the head of the angry mass to acquire information on the airport reopening, Stoic Russians give the hotel staff and other guests dirty looks, a group of French people complain about the hotel food, and a stressed-out Maltese family scream at one another with no restraint. No taxis or public transports are in service at this time and people are literally stuck at the hotel with no chance of getting to their various destinations. I guess it was a one-way ticket on the bus that brought us here. The concierge notifies us that it wont be returning. 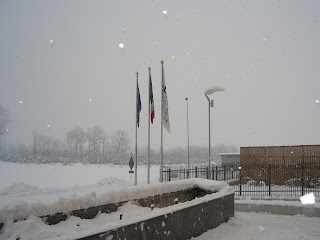 The only way to get back to Malpensa Airport at this point is to walk the eleven miles in the frigid cold in waist high snow drifts...no thank you! Why these people are trying to get back to the airport is beyond me. Malpensa airport is working at only 20% capacity and in my mind the options are to either wait the storm out here in the comfy hotel we've appropriately nicknamed 'The Shining', which happens to be free-of-charge for all of us, or wait at the airport alongside infuriated crazies who would kill to be in our position right now. REDRUM comes to mind…cue chilling horror film music now. We resolve to enjoy our time and look around the property, now covered in snow. We take photos, throw snowballs and make snow angels along with a family and their little boy. Other hotel guests look at us like we’re crazy. Maybe we are, we’re actually enjoying our time, albeit being trapped here. Perhaps we’ve been afflicted with some rare form of contented cabin fever? Our actions aren’t set to bone-chilling soundtracks, we’re not seeing ghosts, and we don’t feel like axing anybody as Jack Nicholson did in The Shining so we concur that we’re all right. A Few Guests Building a Snowman...ours was bigger! We're getting hungry so we go down to the restaurant for lunch. We are seated and automatically given a bottle of red wine, a bottle of white wine, and two menus. We share a lovely Risotto Milanese, saffron-flavored rice covered with osso buco, a kind of stew made from veal shanks braised in white wine, herbs and gremolata (a mixture of garlic, lemon peel and parsley.) We drink our bottle of white wine, talking and laughing; taking our sweet time…because we’ve definitely got the time. We then sip our red wine and finish the bottle after our near four-hour long lunch. We meander our way back up to the room and have a much-needed nap. This eating, drinking, and waiting around thing is really exhausting. The next two days go a lot like the first with the exception of our numerous calls to Alitalia customer service, trying to get a flight out of Milan so that we may finally reach our planned destination of Accra, Ghana. We wait on hold for hours with Zero 7’s song, ‘Destiny’ playing as hold music, looping over and over again. As we memorize the words to the song, we finally manage to get a flight booked to Rome where we will connect to Accra, Ghana. Now that we have a flight booked, that is scheduled to take off; we must find a way to leave ‘The Shining’. We must recover our passports, which the staff refuses to give us until checkout and transportation have been arranged, which literally traps us here. With the adrenaline of a final scene in a horror film we case the hotel reception desk for a few minutes. When the receptionist walks away, we slyly grab our passports from the stack and I nonchalantly put them in my purse, in a way that no one will notice. The few taxi companies that are now operating in the area are overbooked and are not accepting new fares. We sure could use a Snowcat right about now! We overhear an American sports team who has arranged a private shuttle from Milan to take them to the airport. With a good amount of schmoozing they allow us to ride with them back to Malpensa. Thanks boys! We arrive at a very hectic Malpensa Airport and stand in a three-hour long check-in line. We are issued our boarding passes to Rome and make our way to the departure gate. The other passengers, decked out in glamorous Italian fashion- Prada, Versace, Dolce & Gabanna, push and shove to board the airplane that will take us to Rome. Gotta love the duty free shops! Only Italians could look so fabulous after spending multiple nights in the airport…it must be in their genes. We look out the cabin window onto the snow-covered runways, humming the Alitalia hold song. In hindsight, we had so much fun at ‘The Shining’ I don’t know what the hurry was to leave. The Ramada wasn’t at all sinister…it was a much-needed, forced reprieve from our busy lives and a great prelude to our African vacation. In a Boeing 747, flying above the others stuck at ‘The Shining’ near Milan, I finally discover the meaning of those cheesy motivational posters, life and vacation for that matter is not about the destination. It’s about the journey, literally, and the things you learn about yourself in the process.